I was needing to make a wedding card for a friend, so I played around one night and came up with this. I added it over the blue, wrapping a ribbon around all the layers before adding them to my cardbase. 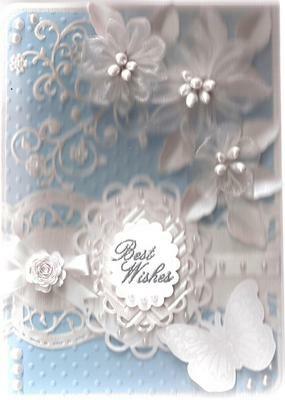 I cut the flourish from cream card and added it, then I layered up the leaves and flowers. The sentiment is embossed with silver powder, cut with a die from the Lacey Ovals set, and layered onto two more Lacey Ovals, both of which have been embossed, with foam between all the layers. 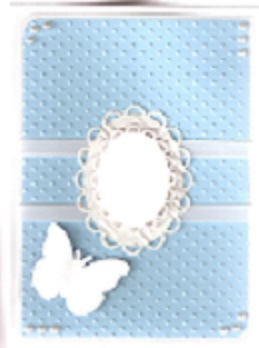 I stamped the butterfly on white cardstock using clear embossing ink and heat embossed it with clear powder. I then added in a bow on the side with a paper rose on top, and self adhesive pearls to finish. The inside of the card is lined, and I created a box to put the card in and layered it with some of the same elements as the card front. This is so pretty and making a box to hold the card always makes it so extra special. It may take a little longer but it is so worth the effort. Thank y'all for the lovely comments... very much appreciated! What a beautiful card. At first glance it looks like you have used parchment. The overall effect is just gorgeous. Faith, you card is beautiful. I love how you've done the flowers at the top. And like Christina says, making the box to go with, just makes it a complete gift. Well done. OMG!! Faith... this is just GORGEOUS!! Absolutely LOVE it!! It's definitely a Big WOW! Your recipient will love it as much, if not more than I do. Thank you so much for sharing.